The simplicity of dementia A Guide for Family and Carers. Published this year (in English), The Simplicity of Dementia offers a good introduction to the world of Dementia. The first two chapters did not inspire me as some books do, however I am glad I persevered. Aimed at families and carers, I found the content of this book to contain a vast amount of information, well written and understandable to those people who may be experiencing dementia for the first time. The chapters describe the experiences of dementia using a number of real-life examples which bring this person-centred book to life. It explores issues of communication, mood and behaviour problems, management guidelines and has a chapter on the family and the problems they experience, including feelings of guilt. 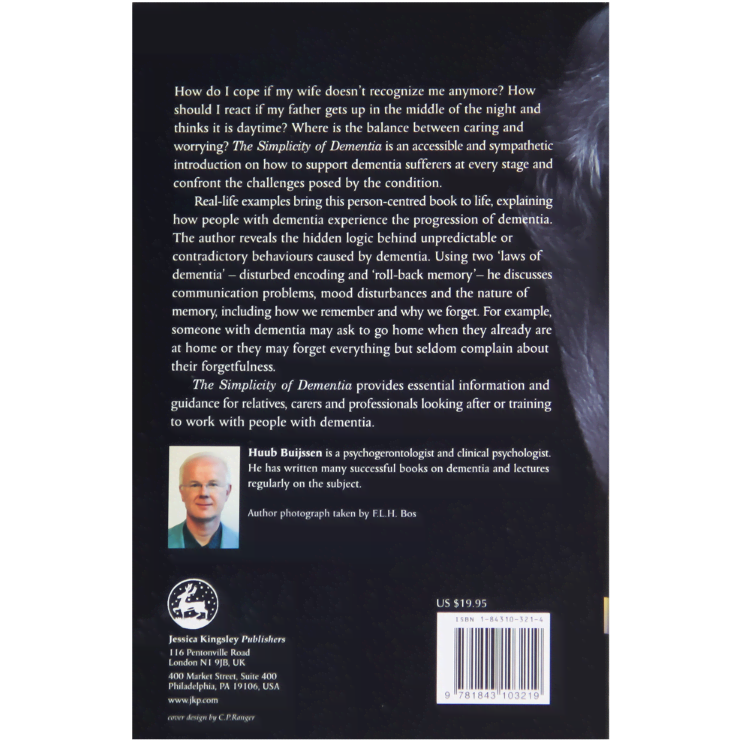 The author bases this book not only on his professional outlook as a psychogerontologist and clinical psychologist, but also as a son, whose own father suffered with dementia. It brings the book to a more interesting level for me knowing the author has lived through the personal effects of dementia. Although there are a large number of references in this book, many of them are Dutch writers, so further reading may be limited. This book would be a good read for anyone wanting to learn about dementia, be it for personal or professional reasons. 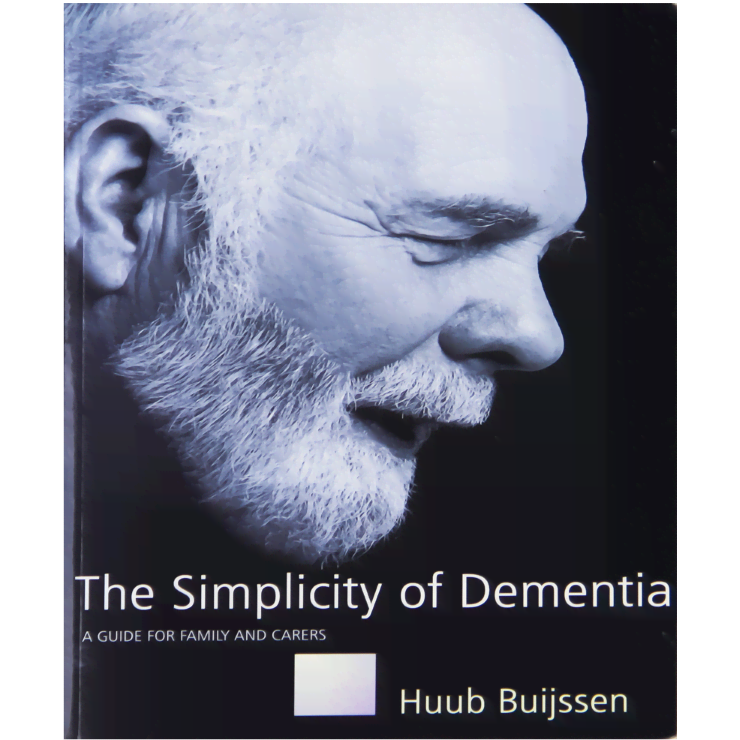 The Simplicity of Dementia by Huub Buijssen, a psycho-gerontologist and clinical psychologist, presents a totally different perspective. It was first published in Dutch in 1999. When the author’s father showed signs of dementia 25 years ago, Buijssen’s family assumed that the son would be able to clarify why the father’s behaviour was changing and would advise them how to respond. This proved a daunting challenge because of the complexity of the disease, and the variability of symptoms across and within individuals as the disease progresses. Over time, Buijssen slowly discovered that there was a simple logic in the signs and symptoms of dementia, and he formulated two ‘ dementia laws’ that helped to understand the ‘ deviant ‘ behaviour patterns of the illness. His first law of dementia is ‘ disturbed encoding’, the fact that information can no longer be transported from short-term to long-term memory. This law helps to explain many of the symptoms of the early stages of dementia. The second law is of ‘roll-back memory’, that long-term memory disintegrates, beginning with the most recent and ending with the most distant memories. When even the earliest memories disintegrate, the individual dies. Buijssen’s ‘roll-back memory’ law is another term for retrogenesis, that is that the capacity for activities and intellectual development are lost in the reverse order to the sequence in which they were learnt. It helps to explain many of the features of the later stages of dementia. Buijssen intends The Simplicity of Dementia as a compact guide for relatives, carersand professionals who look after people with dementia. It is about the symptoms of dementia, how to understand them and how to deal with them. Several chapters address the problems that present the greatest difficulties for those closest to the person with dementia, including communication, mood problems such as aggression and suspiciousness, and behaviour problems such as clinging, wandering and nocturnal restlessness. When addressing a particular problem, Buijssen describes symptoms in clear and concise terms, often quoting from first-person accounts to bring the problem to life. He tries to explain why the problem occurs, invites readers to imagine what it feels like to experience that particular loss, and offers advice on how to respond to the consequent problematic mood or behaviour. The ‘imagine’ scenario creates a ‘ do unto others’ approach to care that shows sensitivity and respect for the person with dementia. The Simplicity of Dementia has much to offer in terms of thoughtful, practicaladvice on caring for someone with dementia. Some readers might cringe at theoccasional value-laden terms that describe people with dementia (such as ‘victim ‘ or `sufferer’). In addition, the translation from Dutch to English is sometimes awkward, and the avoidance of gender-specific pronouns would have improved the readability of the text. These two books on dementia will appeal to different kinds of readers looking for different types of information and support. Whereas Dancing with Dementia is a personal odyssey that challenges and inspires, The Simplicity of Dementia is a primer that provides grounded, practical, common-sense advice. Each has something valuable to offer. author draws on them throughout the book. carers and family, aptly illustrate the points he makes. editors had added a brief supplementary English-language bibliography. concerned with the well-being of a person with dementia. This is a short, elegant, clear book which is a very good starting point for anyone whose friend or relative is diagnosed with dementia. The author has a wealth of experience with dementia patients and their carers, and immense compassion, and it shows. He gently and simply explains what happens as dementia progresses, and makes sense of behaviour which carers can find incomprehensible. He offers valuable pointers on how to cope with dementia, always focusing on the humanity of the patient, and the importance of their feelings, eg by using touch, tone. A very valuable book.